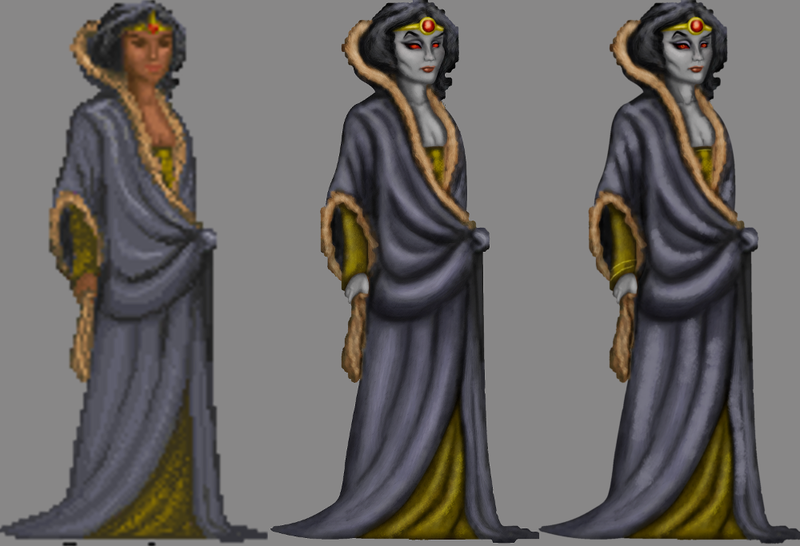 Hey y'all, joined the forum today after seeing jmanowar's post that he's going on hiatus for a little while - I wanted to pick up some of the work of upscaling the NPC flats, because this is genuinely the part of Daggerfall Unity that I'm most excited about. 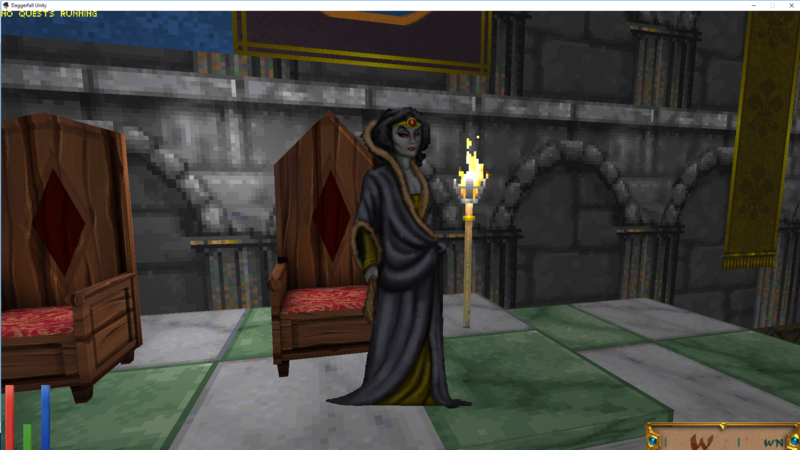 I started with my favorite Daggerfall NPC, both in terms of personality and visual design. 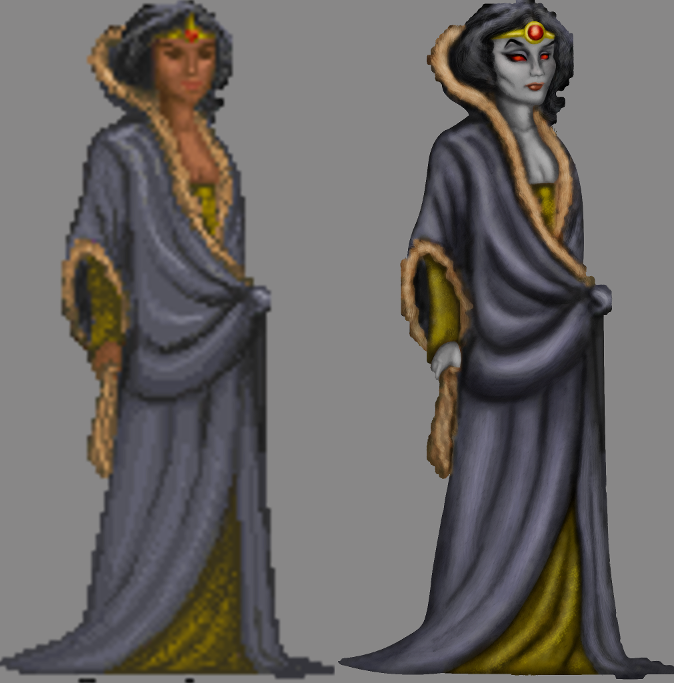 I tried to echo the styles of jmanowar and epicurius so that it will be cohesive with the hires sprites already in game, and I wanted to make her face more like her portrait, while also correcting Bethesda's mistake in terms of her race. However, to be honest I'm not terribly experienced with modding Daggerfall, so I'd appreciate any guidance that people can provide as far as turning this into a usable asset, and anyone who'd be willing to playtest it would be fantastic And of course, if there's an interest, I'll keep going with these as long as I'm able. Last edited by StarMadeKnight on Sun Jul 22, 2018 10:17 pm, edited 4 times in total. Hey StarMadeKnight, welcome to the forums! That's a cracking first post, great work on that flat. You'll find more information on adding textures to the game in this tutorial by TheLacus. Generally just need to name texture in correct format, place into StreamingAssets/Textures folder, and enable graphical mods from the startup window. All the details are in linked page. If you get stuck, please don't hesitate to post and someone should be able to help. Good luck! To get this particular texture working ingame you would need to name it 183_9-0.png and drop it in the StreamingAssets/Textures folder. Thanks guys I tweaked this a little bit, still chasing that painterly look that other flats have, I also gave her pupils and improved the eyes and face a little. I don't have the ability at the moment to test this in-game, would somebody be willing to test it and post a screen here so that I know it's working? I wasn't really sure which export settings to use for the PNG. I also corrected the PNG to png for Linux, but that didn't help. Last edited by Jay_H on Tue Oct 03, 2017 7:18 pm, edited 1 time in total. StarMadeKnight wrote: I don't have the ability at the moment to test this in-game, would somebody be willing to test it and post a screen here so that I know it's working? I wasn't really sure which export settings to use for the PNG. Hm. The second picture is the Andyfall version of Barenziah, not mine. Im not in front of my computer now, but i think the problem may be that Barenziah's flat shows up in a couple of different folders - the game may be referencing the Wayrest flats instead of the noble ones. I noticed the dimensions are hi-res, and the file size is about 1.6 megs. TheLacus, Alexander, any idea on whether that'll affect implementation? StarMadeKnight wrote: Hm. The second picture is the Andyfall version of Barenziah, not mine. Im not in front of my computer now, but i think the problem may be that Barenziah's flat shows up in a couple of different folders - the game may be referencing the Wayrest flats instead of the noble ones.